growth in the automotive industry worldwide, driving an 18.8 million increase in vehicle assembly volumes from 2016 to 2023. Hence many major firms have started investing major chunk of their profits in the R&D department of their firms in their pursuit for continuous improvement of the process and to improve the customer's experience. Autonomous car is one such innovation of the recent times. Experts perceive that it address the issues such as global gridlock and it's a leap in thinking for a viable future. Though many comprehend that it affects only automobile industry, in realty it has either direct or indirect influence on several other industries as well. Cross-continental car trips don’t appear to be on the horizon anytime soon, but domestic and short-haul flights face a significant threat from self-driving cars. 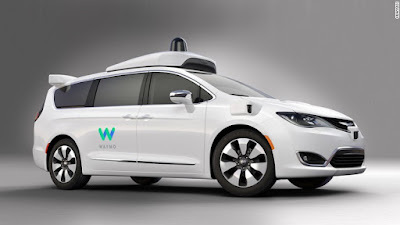 Once autonomous vehicles make car travel more convenient, many people will choose to take an on-demand car ride for shorter trips instead of going through the many hassles of air travel. Further, the average American drives 46 minutes each day, and without having to keep their eyes on the road, they’ll have plenty of time to consume news and entertainment. Broadcasters will compete to provide video content that travelers will be able to consume without risking their safety. For advertisers, it will also create a huge opportunity to present riders with location-based ads for nearby goods and services. from accidental collisions. As a result of decreased collisions, the healthcare industry could lose approximately $500B annually. However, incase of any malfunction of the guiding system may result in an accident due to lack of human judgement. Also, what needs to be done incase of guiding system failure has to be taken care of. These sensitive issues need to be addressed. So in future you can expect that your car follows the smart parking system and talks to calendars of everyone present in your office and helps you decide the best route to take home. We need to wait and see how it unfolds. India is a country blessed by nature in terms of natural resources. It is a source for large number of significant minerals and substances like coal, iron ore, mica, bauxite, natural gas, diamonds, limestone and thorium. India not only has these resources but also tops the ranking list in the world for these mineral reserves. For coal, India has 4th largest reserves, for bauxite 5th largest and for manganese ore 7th largest. Hence as far as raw material strength is concerned, our country has sufficient of it. But still it lags behind a number of countries in utilizing these resources and thus manufacturing. One of the major reasons being its inability to harness these resources. The factors that make India lag behind other countries include legal rules of licensing, control pricing, currency controlling, labor laws, land rules, environment regulations, poor infrastructure, political barriers and corruption that is prevalent. Although India has a good demographic dividend now but it is expected that population of workers aged 15 to 24 will reduce by 61 million by 2030 in India and other BRIC nations. This again poses a serious threat to manufacturing industry. Make in India, a whimsical step taken by our Prime Minister Mr. Narendra Modi is an initiative taken towards boosting manufacturing in India and increase the contribution of manufacturing to GDP from 15% to 30%. Manufacturing is a very important sector for any country and acts to strengthen the backbone of economy. Encouraging manufacturing in our own country will reduce costs and give employment to our people. Creating more employment opportunities will prevent brain drain as well. Effective supply chain will play a huge role in making this a reality. 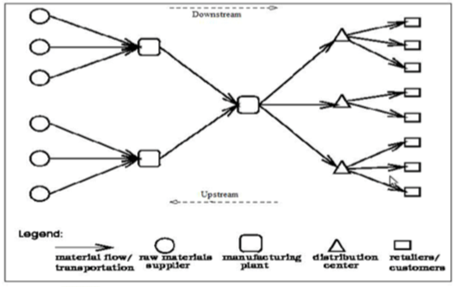 Supply chain involves the whole process of converting raw materials into finished product. 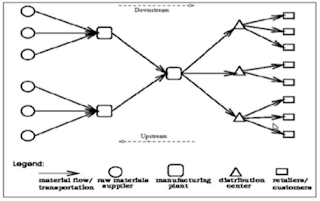 Each stage requires inputs in various forms and value is being added at each stage and so it is known as Value chain. The value addition incurs costs that result in overall effect on final price. Now if the cost at the very beginning stage i.e. raw material cost is high, the ultimate product costs will automatically rise. The reason for high cost of raw materials is that they are imported from foreign countries instead of being extracted from our own country. Now imagine that not only the raw materials are imported but also the manufactured parts and finished products are imported. Imagine the amount of money that is being flown out of the country for no reason. The most important part of excellent manufacturing is well maintained supply chains, but as of now India does not witness a good level of operations management. 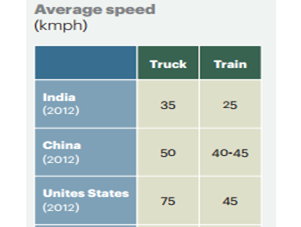 In India a huge portion of gross domestic product equal to 14% is spent on logistics. 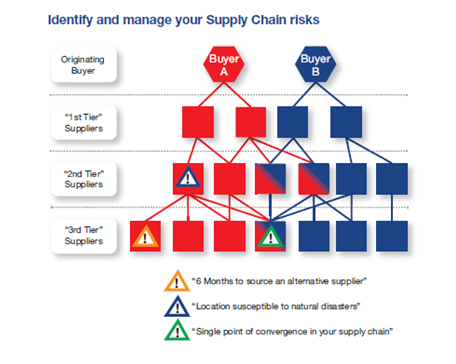 22 % of total sales is caught up in inventories of all the supply chains. Due to inefficient logistic network there is a wastage of 20% in cold supply chains. It is agreed that making development in supply chain in a country like India which is seventh largest according to area, is not that easy but it is not impossible too. The reason for poor logistics network are numerous and they have been effecting production since ages. There are some geographical disadvantages also. As compared to China, India lags behind by two weeks in shipping line from United States. Indian infrastructure which denotes roads, railways, airports, seaports, information technology (IT) and telecommunications is very deprived as compared with other developed and developing countries. Indian infrastructure is rated 54th among 59 countries in comparison to other developing countries (World Economic Forum, 2000). Only 48% of all villages present in India are connected by roads. Indian railways are rated 25th among 59 nations, World Economic Forum and the quality of airport infrastructure is rated 40th among 59 countries. All these figures tell us that infrastructure of India is not up to the mark of handling efficient supply chains. This results in grave disadvantages in acquiring of necessary materials required especially when companies are planning to get global. 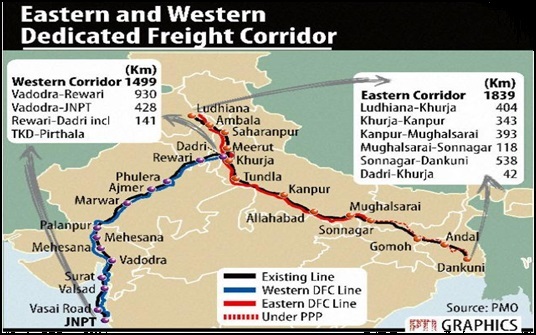 Make in India will promote the up-gradation of supply chains in India by strengthening freight network. This is a cycle of improvement that will take place. Due to Make in India campaign freight network will improve and the improvement leads to achieving better results for Make in India. To make this possible government has kept funds for increasing freight capacity by 50%. Small and medium enterprises hold a very important space in Indian industrial sector as they have been able to perform efficient process of assembling goods in less costs and also maintained the quality standards. There is enough scope of cost reduction due to number of available factors, the only need being to employ them successfully. The reduced cost of logistics will decrease price of goods not only in India but also globally in turn making them more competitive. This will ultimately affect the economy and give us fruitful results being aspired by Make in India. In situations where it is inevitable to import machinery and components there the suppliers should also be asked to import certain minimum amount of components or raw materials from India so that the exchange remains same. Hence improvements can be done in number of areas to come up with better supply chains which play a major role in Make in India. The focus should be on improving all zones including inventory management, operations and manufacturing. Utilization of latest technologies like radio frequency identification will lead to matching the pace of demand and reducing errors. Information technology and analytics should be utilized vigorously to standardize processes and keep a track of all activities. Internet of Things (IoT) and big data analytics will definitely help in making India’s supply chain competent. 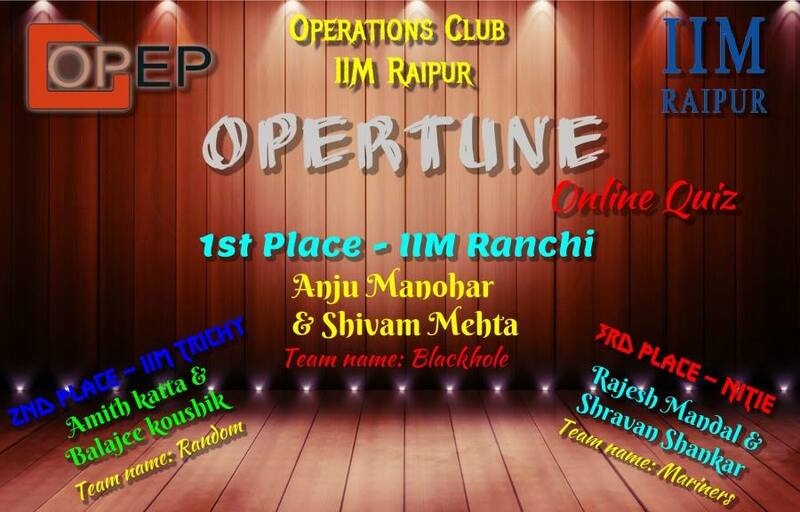 OPEP_Operation and supply chain club , IIM Raipur congratulates the winners. Big data is collection of large and complex data that cannot be processed by using normal data processing systems. Analytics refers to getting meaningful patterns from an unstructured or semi-structured data. Now Big Data Analytics is processing large data (Unstructured, semi-structured and structured) to discover unknown correlations, hidden data patterns, consumer preferences, market trends and other useful business information. The results of analysis can be used for improving operational efficiency, better targeting of potential customer, new avenues for revenue generation, gaining competitive edge over rival firms and better customer service. The main aim of big data analytics is to help various firms to take more informed business decisions by enabling analytics professionals and data scientists to analyze and interpret huge volumes of data which is untapped by traditional business intelligence programs. Big data encompasses internet clicks information, server logs, Content in Social media,various Social network reports, ,mobile phone call records, customer survey responses and market research data etc. Usually only unstructured and semi-structured data is associated with big data, but consulting companies like Forrester and Gartner consider structured data also as a valid component of big data. 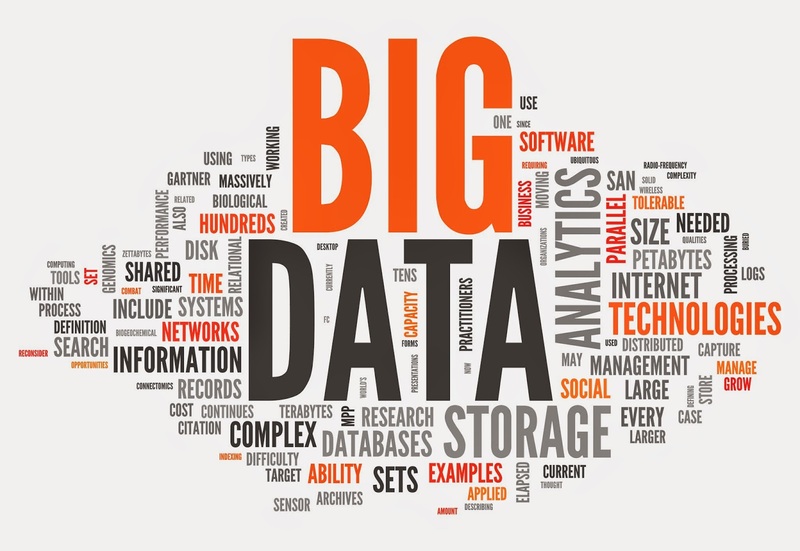 Some software tools that are used to analyze big data are based on predictive analytics .There are new class of technologies such as Hadoop and related tools such as MapReduce, YARN, Spark, Pig and NoSQL databases which can process Big data. These technologies form crucial part of an open source software that supports the processing of large and diverse data. Hadoop is a open source Java-based programming framework that supports the processing of huge data sets in a distributed computing environment. It is part of Apache Software Foundation. It was inspired by Google's MapReduce, a software framework in which any application is divided into numerous small parts. These parts (also called fragments or blocks) can be run on any node (a connection point in a network) in the cluster. Let us now illustrate how big data analytics solution is implemented using Hadoop. LogicMatter is a low cost Big Data Analytics solution provider. Here traditional (e.g. ODS, EDW) and emerging (Hadoop MapReduce) analytical tools are combined to operate on big data. The data platform is built on the powerful and flexible Amazon Web Services Cloud platform. 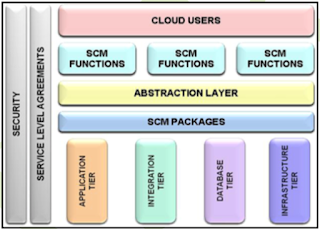 To capture, process, store and transform data, Hadoop is used with the LogicMatter-designed Analytical Data Store (ADS). File-based storage service of Hadoop is used by platform for flexible and fast data processing .This big data analytics platform enables the continuous delivery of both real-time and historical analytics via the popular Tableau. The Analytics platform and solutions is built specifically to solve some complex customer problems such as clickstream analytics, video analytics, sales performance analysis, fraud detection and financial analytics. This platform enables to collect, process, store, and transform both unstructured and structured data exclusively for analytical purposes. It can quickly process various varieties of unstructured data including text, documents, weblogs, XML files, Excel, audio & video, call logs), clickstream, and event data. It can also simultaneously process structured data from familiar enterprise data sources such as CRM, ERP and SQL Databases. The data collection process is separated from transformation and analysis. It allows us to easily add data sources of unknown and known kind without impacting the analysis, a huge challenge with present analytics solutions. Transformation of data is delayed till you need to do the analysis wastage and reducing upfront costs. -LogicMatter-designed ADS (Analytical Data Service). 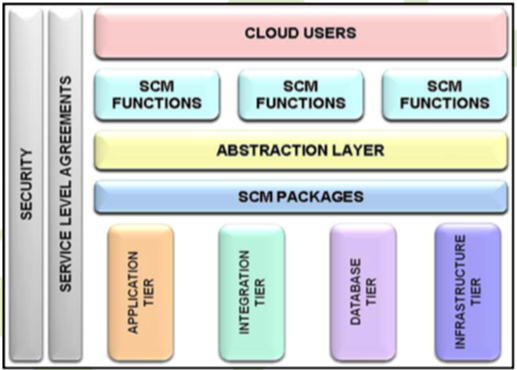 The flexible and scalable Hadoop technology is used to collect both structured and unstructured data. The data collected is integrated, pre-processed and stored in ADS. The flat file-based storage system of Hadoop allows you to scale quickly as well as handle large amounts of known and unknown data. Hadoop is an integrated and intermediate data source and acts as a feeder to the ADS.The data from Hadoop is mapped and transformed to develop a data model. The model built iteratively and stored in the ADS forms the basis for a powerful analytics. ADS uses traditional data warehouse technology – Cubes, and OLAP. Hence, it supports all the powerful and traditional analytical techniques that you are used to (dashboards ,reports, scorecards etc.). 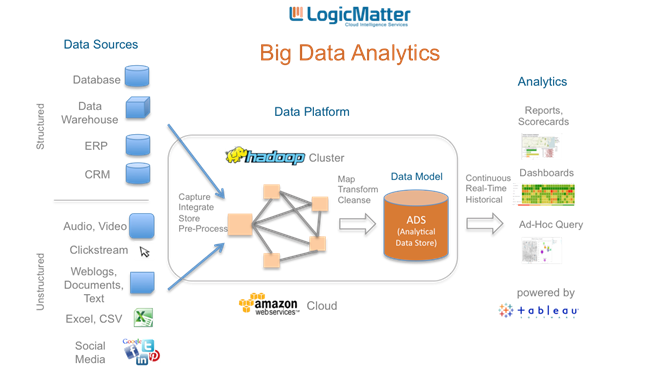 One of the unique design features of LogicMatter’s Big Data Analytics services is to enable continuous analytics both real-time and historical .As there is an integrated data discovery platform ,the visualization tool is directly connected to either Hadoop or ADS for development the analytics. Ad-hoc queries can be run against Hadoop for exploratory analytics and instant data access . For the standard, canned reports and dashboards, you connect to the ADS to gain a historical perspective. The data platform is so flexible that you can easily connect any of your favorite visualization tools (such as Qlikview ,Excel,). There are several examples of how bigger, better, faster, stronger applications, analytics, sensors, and networks are creating results with big data today across various industries. The financial services industry uses big data to make better financial decisions. Banking gaint Morgan Stanley ran into issues doing portfolio analysis on some traditional databases and now uses Hadoop to analyze investments on a larger scale and with better results. Hadoop is also used in the industry for sentiment analysis, financial trades and predictive analytics. Ford’s modern hybrid Fusion model generates up to 25 GB of data per hour. Data obtained can be used to understand driving behaviors, reduce accidents, understand wear and tear to identify issues that lower maintenance costs, avoid accidents, and even confirm travelling arrangements. Companies like Union Pacific Railroad use thermometers and ultrasound to capture data about their engines and send it for analysis to identify equipment at risk for failure if any. The world’s largest multi-carrier network for the ocean shipping industry-INTTRA uses it’s OceanMetricsapplication to allow shippers and carriers to measure their own performance. Companies are also using telematics and big data to streamline trucking fleets . GE believes these types new capabilities can contribute $15 trillion to the global GDP by 2030 by using systematic and data-driven analysis. Walmart is using big data from 10 different websites to feed shoppers transaction data into analytical devices. Sears and Kmart are trying to improve the personalization of marketing campaigns and offers with big data to compete better with Wal-Mart and Target. By analyzing the various customers purchasing orders, companies can now know better about customers who are buying their products. Companies can accordingly target on those customers. Features such as “Customers who bought this item also bought” and “frequently bought together” to reach more customers. Amazon could generate more revenue through these methods. The insights that a company obtain from analyzing market and consumers with Big Data are not just valuable to that company. Firms could sell them as non-personalized trend data to large industry players operating in the same segment and create a whole new revenue stream. There are many companies like Bloomberg and Analytics Quotient which sell the analyzed information to other companies and generate revenues. Factories estimate that a certain type of equipment is likely to wear out after some years. So, they replace every piece of that technology within that many years. Big Data tools do away with such unpractical and costly practices. Massive amounts of data that they access and use and their unequalled speed can spot failing devices and predict the depreciation time. This results in a much more cost-effective replacement strategy for the utility as faulty devices are tracked a lot faster now. Previously when business users needed to analyze large amounts of varied data, they had to ask their IT colleagues for help as they themselves lacked the technical expertise. But by the time they received the requested information, it was no longer useful or even correct. Now With Big Data tools, the technical teams can do the groundwork and then build algorithms for faster searches. They can develop systems and install interactive and dynamic visualization tools that allow business users to analyze, view and benefit from the crucial data. To deal with the consequences of their fast expansion, more number of smart cities are indeed leveraging Big Data tools for the benefit of their citizens. Oslo in Norway, for instance, reduced street lighting energy consumption by 62% with a smart solution. The Memphis Police Department started using predictive software in 2006 and has been able to reduce serious crime by 30 %. Portland city in Oregon, used technology to optimize the timing of its traffic signals and was able to eliminate more CO2 emissions in just six years. 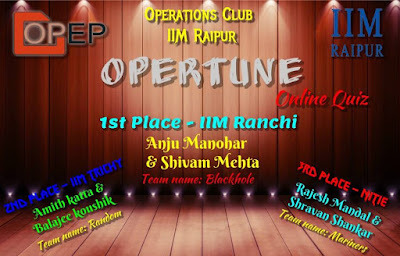 The article is written by B.kiran kumar.He is currently a PGP first year student of IIM Raipur.He has 3.9 years of experience at virtusa.